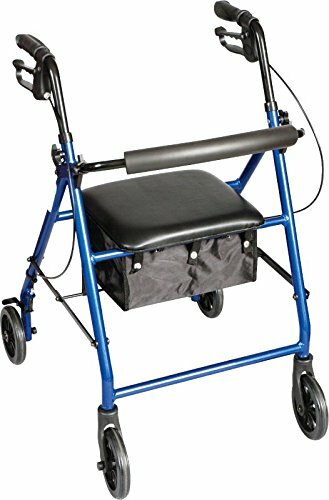 This Rolling Walker has lockable hand brakes and a padded seat and back rest that provide comfort and safety during use. The convenient storage area under the seat can hold personal items. Quickly folds for storage and transport. No assembly required. Handle height is adjustable from 30-36 inches. 300lb Weight Limit. A33577 Key Features: Height adjustable handles with locking hand brakes for safety while sitting, Convenient storage area holds personal items, Padded seat and backrest provide comfort while seated, Folds easily for storage and transport, 6" wheels for increased maneuverability, Carex provides lifetime limited warranty.